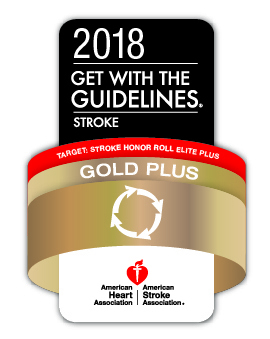 UT Medical Center again has been recognized by the American Heart Association/American Stroke Association for outstanding stroke care with the Get With the Guidelines Stroke Gold Plus award. The award recognizes UTMC’s commitment to ensuring stroke patients receive the most appropriate treatment according to nationally recognized, research-based guidelines according to the latest scientific evidence. The hospital earned the award by meeting specific quality achievement measures for the diagnosis and treatment of stroke patients at a set level for at least the last two calendar years. These measures include evaluation of the proper use of medications and other stroke treatments aligned with the most up-to-date, evidence-based guidelines with the goal of speeding recovery and reducing death and disability for stroke patients. In addition, UTMC this year received the Target: Stroke Elite Plus award, recognizing hospitals achieving Time to Intravenous Thrombolytic Therapy less than or equal to 60 minutes in 75 percent or more of applicable acute ischemic stroke patients treated with IV tPA and door-to-needle time. This entry was posted on Friday, June 15th, 2018 at 2:13 am and is filed under News, UTMC, UToday .